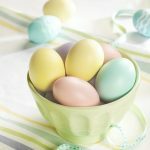 Join this group and share your favorite things about Easter. Everything related to the celebration of this wonderful holiday can be added here. This includes all the important days leading up to Easter such as, Palm Sunday, Maundy Thursday, Good Friday, etc. Many Christians worldwide celebrate Easter with special church services, music, candlelight, flowers, and the ringing of church bells. Easter Sunday is one of the most festive events among Christians worldwide. It commemorates Jesus Christ’s resurrection from death and the symbol of the cross and images of Jesus Christ are remembered on Easter Day. Although Easter maintains great religious significance we also celebrate Easter with coloring hard-boiled eggs, Easter egg hunts, candy, the Easter Bunny, Easter baskets, presents, the Easter Lilly along with Daffodils, and Tulips which all symbolize purity, parades, and gathering together with family and friends for a day of celebration. This is a group for all things Easter.